Just before we evacuated for Hurricane Irma, Mushu received her box from Chewy.com. We opened the box and put the snacks in her Mushu-to-go bag so that they would come with us. I chose not to introduce a new snack to her until a few days after the storm passed since she was shaken up enough about the storm and being uprooted from her home. Once the storm had passed and she was a bit more used to living at Nana’s house…with a cat, I pulled out the Blue Basics Biscuits (say that 10 times fast). At first, Mushu smelled and licked the treat and then walked away. Hmmm, what’s wrong Mushu? This treat is a bit hard so I broke it into 2-3 pieces and in a little while she gobbled it right up. My picky dog knows exactly what she likes and how she likes it. I’ve been breaking up the Blue Basics Biscuits ever since and she is one happy pup. Blue Basics Biscuits are made by Blue Buffalo. They are limited ingredient turkey and potato dog treats, which make them perfect for dogs with sensitive tummies. They are corn, wheat, and soy free so they are great for most dogs with food allergies. 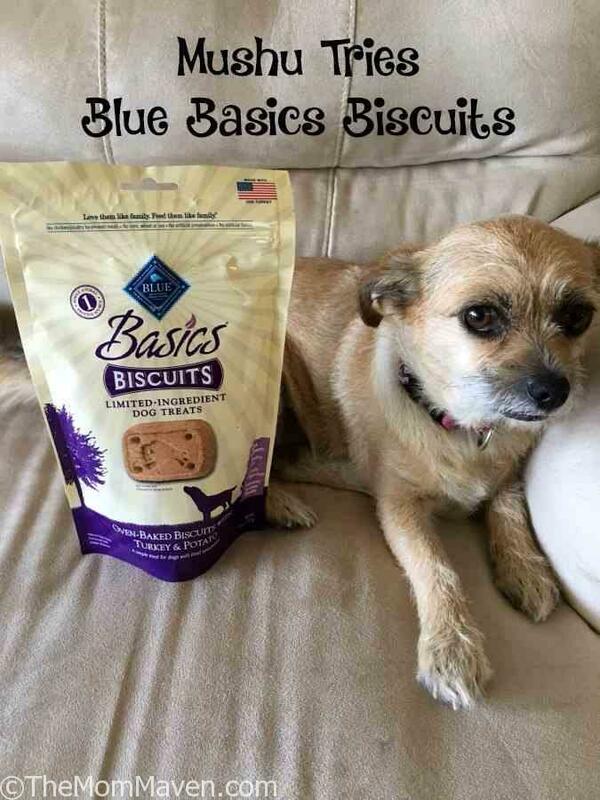 These Blue Basics Biscuits are available for $4.67 for a 6 oz bag from Chewy.com. They are also available in Salmon and Potato flavor.